Medium to heavy flavor, but seldom overpowering. There are few better woods to use for smoking meats. 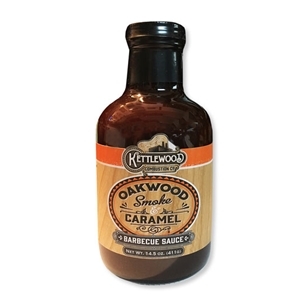 Kettlewood paired the rich smoke flavors of the oak tree with the indulgent flavor of caramel for a sweet and bold experience. Best used on lamb, beef, brisket & sausages. Tomato puree (water, tomato paste), cane sugar, distilled vinegar, molasses, tapioca starch, salt, natural oak smoke flavor, onion powder, tamarind concentrate, garlic powder, spices, caramel color, natural flavor.